href = reffilter(hd) returns a new filter href that has the same structure as hd, but uses the reference coefficients and has its arithmetic property set to double. Note that hd can be either a fixed-point filter (arithmetic property set to 'fixed', or a single-precision floating-point filter whose arithmetic property is 'single'). the filter href returned by reffilter has the reference coefficients of hd. double(hd) returns the quantized coefficients of hd represented in double-precision. 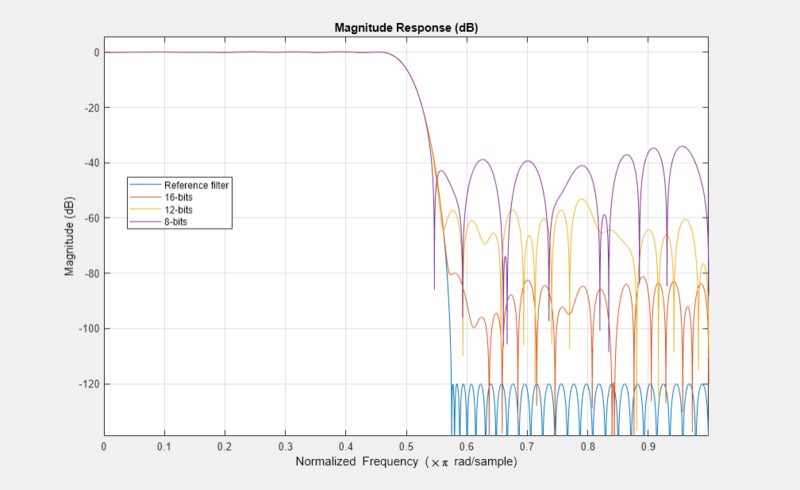 To check the performance of your fixed-point filter, use href = reffilter(hd) to quickly have the floating-point, double-precision version of hd available for comparison. Compare several fixed-point quantizations of a filter with the same double-precision floating-point version of the filter. h = dfilt.dffir(firceqrip(87,.5,[1e-3,1e-6])); % Lowpass filter. h1 = copy(h); h2 = copy(h); % Create copies of h.
h1.arithmetic = 'fixed';  % Same for h1. h2.arithmetic = 'fixed';  % Same for h2. The fvtool shows href, the reference filter, and the effects of using three different word lengths to represent the coefficients.